Review by AllTheBestFights.com: 2018-10-29, pretty good fight between Daniel Ghita and Dzevad Poturak 4: it gets three stars. Daniel Ghita entered this fight with a professional kickboxing record of 50-11-0 (39 KOs=78%) but he is not ranked as he hasn’t fought since June 21, 2014 when he was defeated by Rico Verhoeven (Rico Verhoeven vs Daniel Ghita 2); before this bout, in 2013, he had beat Errol Zimmerman (Daniel Ghita vs Errol Zimmerman 2). His opponent, the 2014 WAKO Pro world champion Dzevad Poturak, has an official record of 52-33-1 (31 knockouts) but his last victory was in 2015, against Frank Munoz, after this bout he has lost 10 consecutive fights, the last one with Alexey Ignashov. In their previous bouts Poturak defeated Ghita once, in 2008, while in 2010 and 2012 Daniel beat Dzevad (Daniel Ghita vs Dzevad Poturak 3).Ghita vs Poturak 4 is the main event of Colosseum Tournament IX. Watch the video and rate this fight! Review: 2014-06-21, disappointing fight between Rico Verhoeven and Daniel Ghita: it gets two stars. Rico Verhoeven entered this fight with a professional kickboxing record of 43-7-1 (8 knockouts) and he is ranked as the No.1 heavyweight in the world, he is 25 years old (8 years younger than Ghita) and he suffered his last defeat in 2012 when he faced Semmy Schilt, since then he has fought five times winning the Glory Hw tournament at the end of 2013 beating Daniel Ghita in the final (=Ghita vs Verhoeven). His opponent, Daniel Ghita, has an official record of 50-10-0 (39 KOs=78%) and he entered as the No.2 in the same weight class, after his last loss against Verhoeven he fought once defeating Errol Zimmerman (=Ghita vs Zimmerman 2). 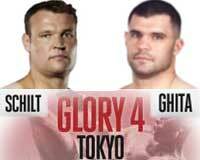 Ghita vs Verhoeven 2, main event of Glory 17, is valid for the Glory heavyweight title. Watch the video and rate this fight! Review: 2013-10-12, great performance and amazing pace by both fighters that exchanged shot for shot in an exciting and tough fight: in a fight like this, there is not a loser but two winners, Daniel Ghita vs Rico Verhoeven is definitely one of the best kickboxing fights of 2013 and it gets four stars! Daniel Ghita (49-9-0) entered as the No.4 heavyweight in the world while Rico Verhoeven (41-7-1) entered as the No.6. 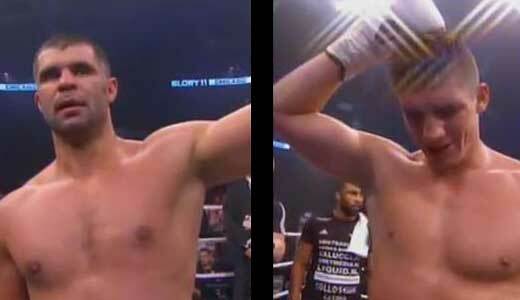 Ghita vs Verhoeven is the final of Glory heavyweight world championship tournament (they also faced each other a second time on Jun 21, 2014 Verhoeven vs Ghita 2); undercard of Tyrone Spong vs Nathan Corbett 2 – Glory 11. Watch the video! Review: 2013-06-22, great start and spectacular finish: Daniel Ghita vs Brice Guidon is very close to get four stars. Daniel Ghita (47-9-0) entered as the No.3 heavyweight in the world while Brice Guidon (28-8-0) entered as the No.7. Ghita vs Guidon, superfight of Glory 9 New York. Watch the video!